If 40 is the new 30, then the CN Tower at 42-years-old and 1,815-ft tall, is staying young. Once crowned as the tallest free-standing building in the world, Toronto’s most recognizable icon remains a must-visit, recently lifting the curtain on a fresh look for its Observation Level. The renovation is part of a larger project to modernize the attraction, improve experience and accessibility for all. Cool is a new – free — virtual reality app that helps guests identify over 90 landmarks, even on cloudy days. Three sections of the Observation Level now sport floor-to-ceiling “window walls” that provide an expansive, near-seamless, unobstructed bird’s eye panorama of the city, especially for children and mobility challenged guests. 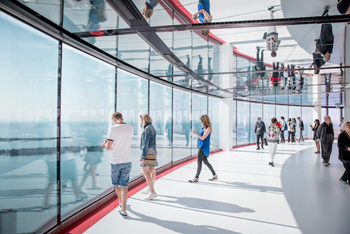 The ever-popular Glass Floor – the vantage point for the daring — received an additional layer for a new two-tier view. Perched 1,136-ft. off the ground, the refreshed level offers space flexibility for customizing group events for up to 800. Use the entire area, or cordon off a section. Three new food kiosks make great bar stations with catering provided by the tower’s 360° Restaurant culinary team. Host a progressive event for up to 1,400, with cocktails and after-party on the Observation Level, and dinner in the restaurant.